The Crimean War began in 1853, when Tsar Nicholas II invaded the Ottoman-controlled territories of Moldavia and Wallachia. The Ottomans won early victories at Kalafat and Oltenitza (see the article opposite, ‘Heartsease for the Czar’), and Britain and France joined the fray on the side of the Ottomans. John Leech’s image captures a moment when the British public believed that Nicholas’s belligerence was about to backfire on him. The reality was less simple: though the Russians eventually sued for peace in 1856, the British suffered some 40,000 casualties, and the Charge of the Light Brigade ensured that the Crimean War long stood as a symbol of British bungling. 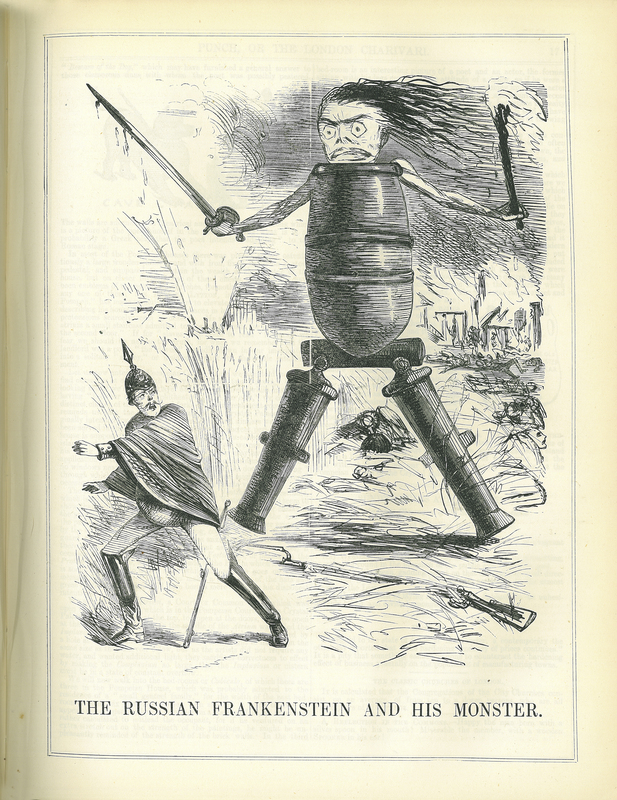 John Leech, “‘The Russian Frankenstein and His Monster’ in Punch, or the London Charivari ,” ourheritage.ac.nz | OUR Heritage, accessed April 26, 2019, http://ourheritage.ac.nz/items/show/10852.